Being patriotic and the ability to respect the sacred symbolism of our flag seems less common today. I believe to lack in this will impact character and the ability to appreciate the freedoms we possess. When you believe you should have or deserve ‘a to z,’ why appreciate it? The disconnect is a disservice to our young people and our nation. Young people may be easy to dismiss the need to stop for the Pledge of Allegiance or the significance to rise at the sound of the Star Spangled Banner. “Why is this necessary?” This is a common thought when we expect actions without connecting the significance. If we don’t take the time to explain, how do we expect them to grasp its magnitude? We are blessed a million times over…. As a young person I was proud to be an American, but never grasped its meaning until I stepped foot abroad. I spent a summer in Belarus during college. It rocked my world. Years following the fall of communism there were obvious signs that freedom was not abundant and opportunity was limited. From one’s college selection, career path, ability to speak your mind freely on religion and politics; freedom was not abundant. I was able to experience outside the scope of a traditional tourist. I forged friendships and delved into Bela -Russian culture. My heart was heavy with a land that seemed to be in a rut in what was in past and what lie ahead. It was at a Yankees baseball game shortly after my return to the States that freedom, and its cost, slammed me in the the face. As the Star Spangled Banner played I found myself emotionally unhinged. I tried desperately to hold back tears as the lyrics bellowed throughout the stadium. I was overcome with emotion. At that moment I was humbled to be an American. In that split moment of my life the soil I stood on was one I was so grateful for. I was paralyzed with gratitude to those who sacrificed for me. I was filled with pride and humility to wear the title, American. 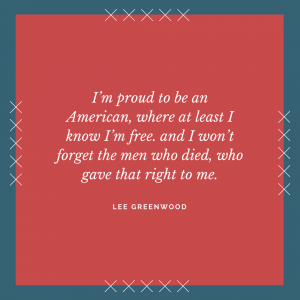 Raising patriotic teens and its connection to character…. So you may think, “I’m not sending my kids to Eastern Europe.” You don’t have to. What better place to instill a sense of patriotism for their country than…in their country? Wahoo! When we utilize what resources we have around us good things take place! We start with..you! Find some time to sit down with your kids and explain what significance our flag holds. Let them know why we stand for the Pledge. Fill them in on the meaning of the Star Spangled Banner. If you have any family members who serve or who have served, add their story and sacrifice. Allow them to gain a grasp of what sacrifice and freedom looks like. Getting down to the nitty gritty…. Road Trip: If you are up for a road trip visit a memorial site near you. Many towns have an area designated for those who gave their lives for our country. A life altering experience is the Veterans Wall in DC. This is a must for every American. Vets: If you have family members who have served take time to ask questions. Be sensitive and ask before hand what they are comfortable with. Not only will your child learn about history and its significance, but they will gain deeper insight into a family member. If you are batting zero with family members, utilize people in your neighborhood, church or even work place. Vets are walking, breathing history. Homeless Outreach: The unfortunate reality is many of our homeless are vets. They are often dismissed, which is unfair. Whether PTSD, an addiction formed from the trauma of serving, etc. the road has lead them to be homeless. If you want to open heart and mind take a trek with your kids and pass out a few bag lunches. You will 100% encounter a vet. Spend a few minutes chatting; I will assure you it will be a learning experience for everyone. This is a rock your world experience that few take advantage of out of fear or discomfort. Be uncomfortable, because they certainly placed themselves in the uncomfortable world of battle, death and suffering for us. Raising patriotic teens is much easier than we realize, but our words and actions are a big facet of this process. We are blessed to live in an amazing nation. It is one that allows freedoms and privileges due to the sacrifice of others. Let’s reinforce the beauty of our flag, country and our freedoms. Wishing you a week of some solid red, white and blue!